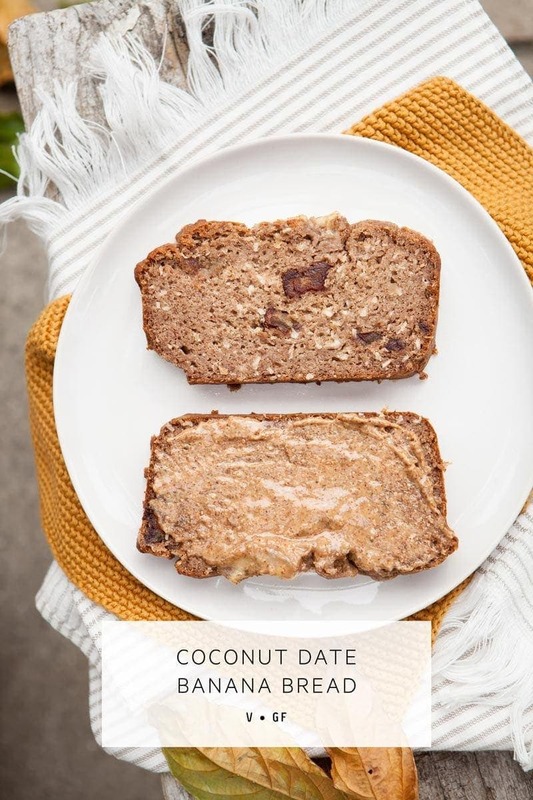 A simple, gluten free Coconut Date Banana Bread with no added sugar, sweetened naturally with whole dates. 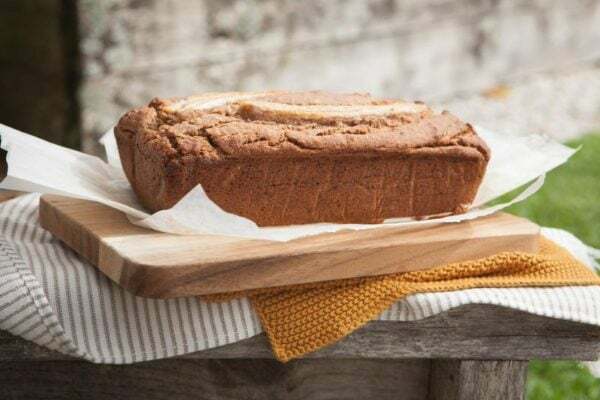 Soft and a little more cake– than bread-like, this is a large recipe to feed a hungry family! Devoured in minutes in our household. Firstly, what an exciting week! 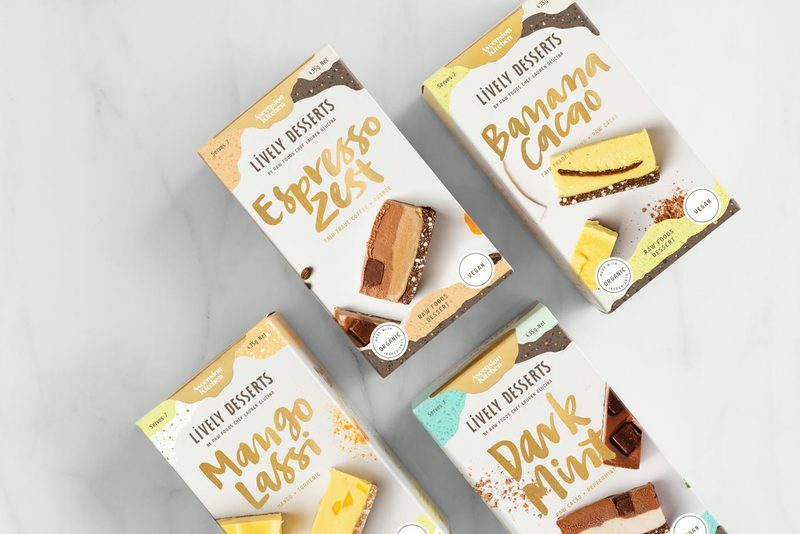 The launch of my new LIVELY™ Desserts range has been full of highs so far. I’ve been blown away by the immense feedback, well-wishes and calls to stock it nationwide (actually – worldwide!) – such a trip! Thank you! One comment really put a smile on face however – a lady on facebook shared simply that she had already bought one, and her family thought it was just delicious. Holy. Moly. The first real-live person other than my family to enjoy the desserts! It certainly feels good to see it all come to fruition after all these years of hard work. The mission is now to spread these little boxes of happiness far and wide, sharing the message of conscious and compassionate eating, and connecting people with this website to provide further inspiration on healthy eating, by cooking from scratch and including more nutrient-dense plant foods into the diet. Today’s recipe is a family favourite. 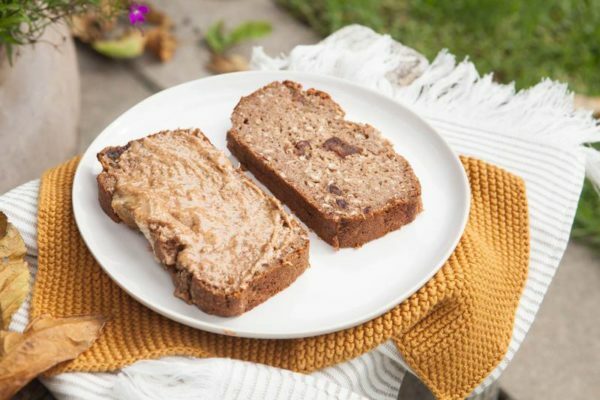 An extremely generous gluten free vegan banana bread, sweetened naturally with whole dates. I think this is a great Easter recipe. 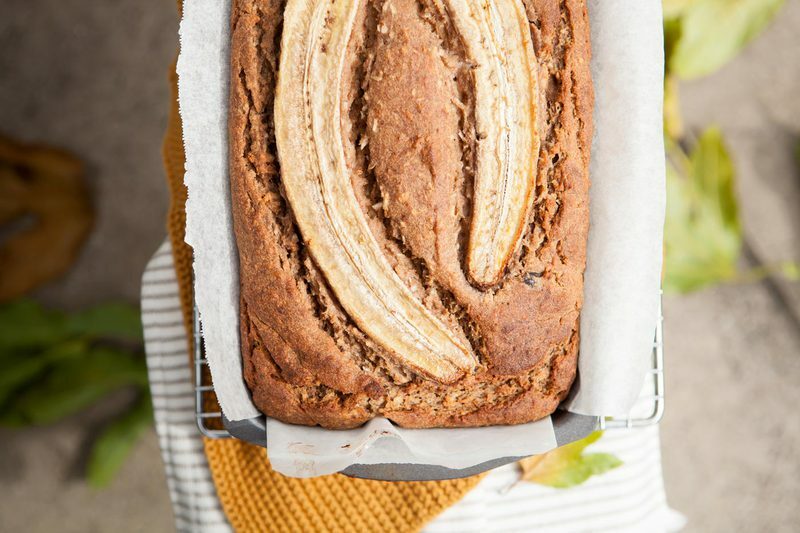 Long weekend, cooler weather, rain, cozy blankets and banana bread. I have used a blend of sorghum and buckwheat flour for this. In fact, these two flours have become staples in the kitchen for me – particularly the sorghum as it is just so easy to work with. Sorghum is a neutral to mildly sweet gluten free grain packed full of B group vitamins. It contains some prebiotic fibre in the form of beta-glucan, and is relatively high in the minerals iron and phosphorus, and contains varying amounts of calcium, magnesium, potassium, sodium and zinc. Buckwheat is a favourite of mine due to its rutin and quercetin content – two potent flavonoids that enhance the action of vitamin C, work as antioxidants, reduce inflammation and support cardiovascular health. Quercetin is also a great anti-allergy compound, inhibiting the degranulation of mast cells (when the contents of these mast cells are spilt, you get your typical allergy type reactions kick in, such as itching, swelling, weepy eyes). The recipe is super quick to prepare, and makes a fantastic large sized loaf. We still have a family dinner every Sunday evening at my parent’s place, and when I served this last week, it was carved up into smaller portions so everyone got to take some home to toast up for breakfast. The only downside of a large recipe of course is that the cook time is a bit longer. Enjoy, and Happy Easter! I hope you get lost of rest, peace, love, joy, and eggs! 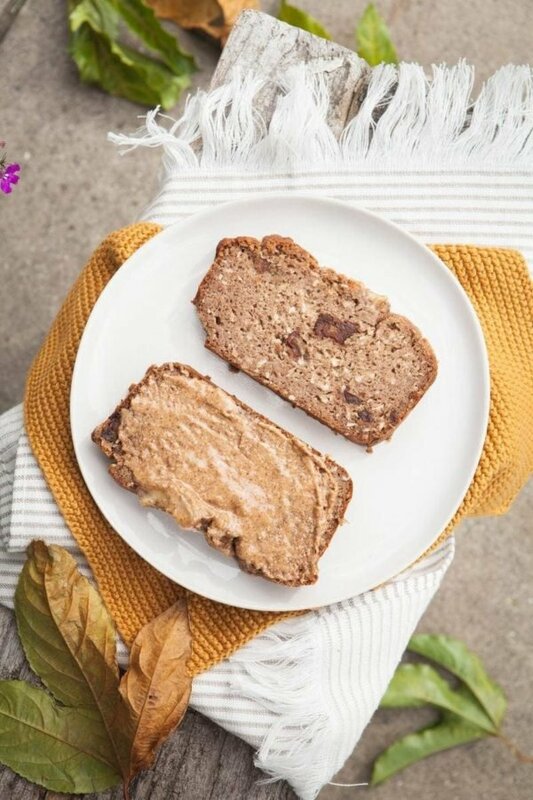 A vegan, gluten free Coconut Date Banana Bread. No added sugar - sweetened naturally instead with whole dates. A simple, family sized recipe! Pre-heat oven at 160˚C (320˚F). Line a loaf tin with baking paper (I used a relatively wide tin). Place all dry ingredients in a large bowl and mix to combine. Place all wet ingredients in a blender, reserving about a ¼ cup of dates (chop and fold through the mixture at the end for added texture). Blend till smooth. Pour the wet mixture over the dry and fold together till combined. 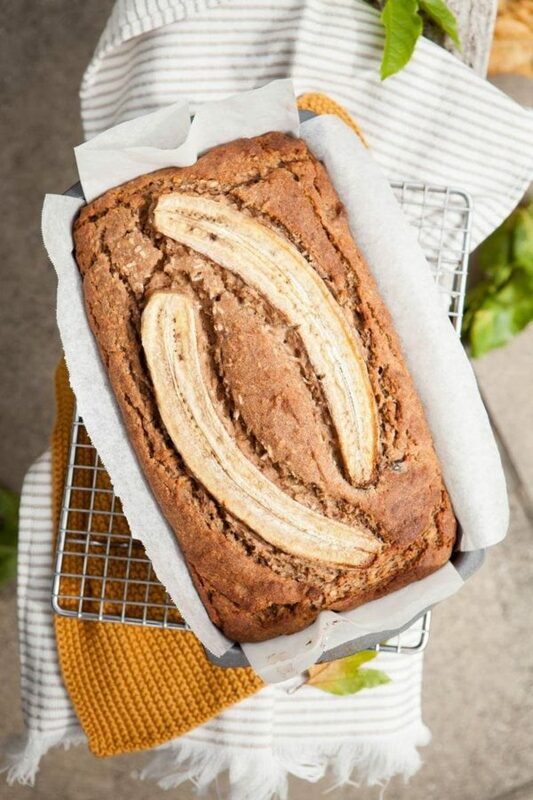 Quickly pour the batter into the loaf tin and place a sliced banana over the top. Place in the oven on a rack in the middle, and bake (forced fan) for 1 hour 15 minutes or until a skewer comes out clean. Once cool, remove from tin and let cool completely on a wire rack before serving. • THIS LOAF IS EPIC! It’s family-sized for sure. 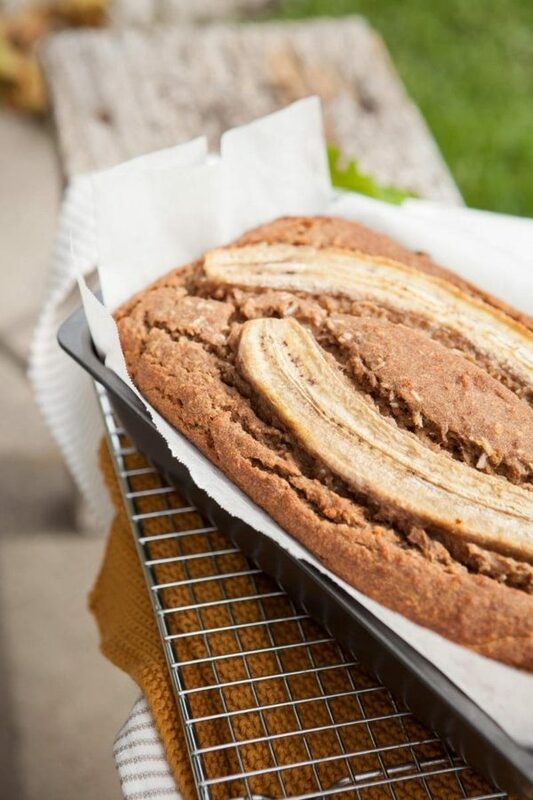 Halve the recipe and you’ll still get a good sized banana bread. • A narrower cake tin may require a longer bake time to cook the middle. • If the bread starts to brown, cover with foil for the remainder of the cooking time. • Resist the urge to open the oven door until it’s close to being ready, otherwise the loaf may collapse. Likewise, fresh baking soda is needed to ensure it rises. 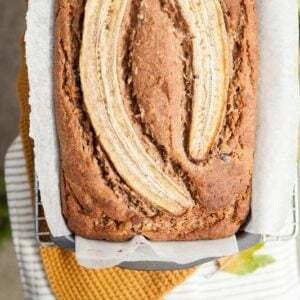 • Xanthan gum helps to bind the flour since we are using quite a large amount – however you may get away with omitting it – bananas are also a great natural binder. I don’t see a need to use an egg replacer such as chia, flax or psyllium.